What the ABC News politics team is tracking in the week ahead. camera (ABC News) John Boehner speaks at a press conference about his resignation. All it took was a papal visit to get Washington moving again -– and moving, and moving. Fast enough to get another 2016er out of the race, force the Democratic frontrunner to come up with a position on the Keystone Pipeline, and even hasten the end of a speakership. It’s a time of sweat and insecurity, empty rooms, reappearing emails, and –- cue the pope’s influence again -– just a little less Donald Trump. There will be tears. The stunning announcement by House Speaker John Boehner that he intends to resign from Congress scrambles the leadership portrait on Capitol Hill, during one of the more tense moments in recent memory. Funding for the federal government expires midnight on Wednesday, with conservatives intent on forcing a showdown over Planned Parenthood. Boehner’s exit makes a government shutdown less likely -– it lets off Tea Party steam, and frees Boehner up to rely on Democratic votes -– but it muddles the landscape beyond that. 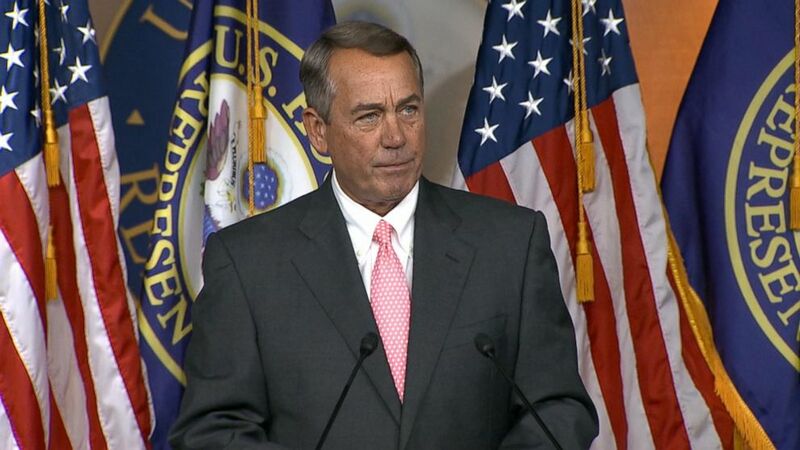 Boehner is leaving with grace and promising to work until the end. Yet the maneuvering his exit sets up pits Republicans against themselves, with several 2016ers set to play prominent roles. There’s now a vacuum at the top, with a leadership fight likely to put tea-party forces in opposition to the GOP establishment, all over again. Trump’s rivals are sensing soft spots, as the Donald copes with half-empty rooms and escalates his battle with Fox News. Polling suggests that Trump’s rise has slowed, and several of his rivals -– Ben Carson, Carly Fiorina, and Marco Rubio in particular –- are in striking distance. Characteristically, Trump is warring with all of them, and Rubio in particular. Trump drew rare boos from a crowd in Washington Friday when he called Rubio a “clown,” suggesting limits to the appeal of his act. Trump is still the GOP frontrunner, but his campaign is now facing more scrutiny and more challenges. Trump plans to huddle with a group of religious leaders on Monday, and meet separately with Fox News executives later in the week – two meetings that could determine the course of his campaign from here. Those desperate end-of-quarter fundraising appeals may have a ring of truth to them this time around. The original field of 17 Republican candidates is already down to 15, with two A-list contenders -– Scott Walker and Rick Perry -– the first to see the money dry up and force them out. They’re unlikely to be the last to drop long before voting starts, and the money crunch around the Wednesday quarterly filing deadline is a testing ground for candidates’ viability. So might be the still-to-be-released criteria for the next GOP debate – a forum that’s unlikely to include an undercard. A week of complicated geopolitical encounters continues on Monday, with President Obama expected to meet Russian President Vladimir Putin while both men are in New York City for the United Nations General Assembly. It’s been a while since the world got to observe the awkward body language that comes with such meetings, and their agenda will be crammed with discussion of Ukraine and Syria, as tensions grow in both Europe and the Middle East. The discussions will cap a hectic few days of visits by powerful world leaders, with Pope Francis and President Xi Jinping of China also getting time with Obama. We can only imagine that Putin will be thinking about his first meeting with President Trump while he’s in town.